On the surface, the novel Dune fulfills a popular imperialist fantasy by granting its main character mastery over native “others” whose superstition and history makes them comprehensible and exploitable. However, it is also a book of schemes, assassination, betrayal, hidden motives, and unexpected consequences. Like the novel’s main antagonists, this fantasy ends stabbed and poisoned on the floor of a broken palace. In certain ways, Herbert’s embrace and subversion of orientalist tropes around knowledge even anticipated modern critiques of empire. Herbert’s influences were eclectic, but one of the most obvious was the language, imagery, history, and religion of the Middle East. Herbert was in fact directly inspired by the writings of T. E. Lawrence, the famed British military officer who, during the First World War, became intimately involved with aiding the Arab Revolt against the Ottoman Empire, inspiring the critically acclaimed 1962 film Lawrence of Arabia. In 1965, these themes were unusual, although not unknown, in the world of American science fiction, but Herbert was also building on a long tradition of fascination with the Middle East and the “orient” more broadly in western art. This was not just Arabian window dressing. The themes and tone of the book—including usurpation, espionage, mystery, mysticism, and salvation—tap into orientalist tropes and clichés such as the idea of the desert people possessing an unusual clarity of vision honed by their environment. The hostile desert planet Arrakis, like the deserts of North Africa and Arabia in the minds of modern British imperial officials and travelers, is a land of inscrutable natives, indispensable resources, and poetry, as well as both psychic danger and opportunity. An all-human galactic empire in the distant future sets the opening scene of Dune. The precarious empire is held together through a delicate balance of power between factions that are completely dependent on a mysterious drug called “spice,” which can only be collected—at great risk and expense—on Arrakis. Spice is the most precious commodity in the galaxy because it prolongs life, enhances the senses, and can trigger superhuman mental and physical powers in people who are trained correctly. Duke Leto Atreides stands out as a charismatic leader who has a knack for finding talented subordinates and inspiring their loyalty. 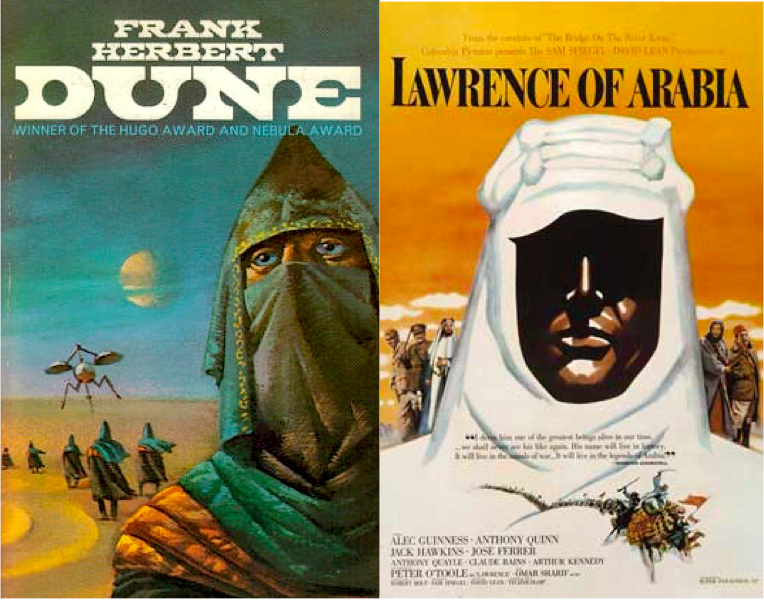 The main character of Dune is Leto’s son, Paul Atreides, in whose character the Lawrence of Arabia parallel is most explicit. Through a complicated, clandestine breeding program Paul also has the potential to become a “Kwisatz Haderach,” a superman who can theoretically use a combination of mental discipline and spice to both see the future and access the “genetic memories” of his ancestors. The book opens with the Atreides faction winning what looks on the surface to be a favor from the Emperor: a seat on the board of the merchant company and feudal lordship over Arrakis. Like British politicians and soldiers in the First World War, Leto hopes to recruit the native desert people—the Fremen—to fight alongside the Atreides. He suspects that their martial skill can help overturn the existing imperial power structures. The emperor’s gift of Arrakis is, the book quickly reveals, a trap, with echoes of British colonial policies in Iraq in the 1920s. The Atreides are betrayed by their most trustworthy servant. Leto is forced to take his own life as an alternative to torture at the hands of the sadistic Baron Harkonnen. The Atreides forces are attacked and scattered by the emperor’s elite soldiers disguised in Harkonnen livery. Paul and his mother Jessica barely escape. They flee into the desert, where they fall into the hands of the mysterious natives of Arrakis, the Fremen. The Harkonnens take back Arrakis and intensify spice harvesting while using air power to suppress the Fremen, in much the same way as, Priya Satia points out, the British sought to use air power to intimidate and cow Iraqi Arabs in the aftermath of the First World War. But the Harkonnen policy is based on incomprehension. Like the interior of Africa in H. Rider Haggard’s most famous novels, She, King Solomon’s Mines and Allan Quatermain, the deserts of Arrakis hide a lost civilization, or at least one that is much more sophisticated and extensive than the ostensible lords of Arrakis know. The Fremen are not a small group of fringe nomads. On the contrary, their harsh environment has made them sophisticated, focused (albeit superstitious) survivalists and warriors. Among the Fremen, Jessica and Paul are able to use a set of implanted religious prophecies to claim special authority as priestess and messiah. During an orgiastic spice-laden religious festival, Paul learns to use his body to convert a toxic version of spice into a form that humans can take, in the process unlocking his genetic potential as Kwisatz Haderach. With further allusions to Lawrence of Arabia, Paul is able to use his combination of physical, mental, social, and historical training to win the respect of the Fremen, command their obedience, master the supply of spice, and, finally, not just take revenge on the Harkonnens and the Emperor, but also win the Imperial throne for himself. On the surface this sounds like the ideal nineteenth or early twentieth-century European fantasy of imperial knowledge and control. Paul has the best of all worlds: Kipling’s Kim, King Arthur, and (T.H. White’s) Merlin combined. The desert and the spice enable the transformation that early twentieth-century British travelers to the Middle East like T. E. Lawrence and Aleister Crowley dreamt of and feared. Paul “goes native” and learns the ecological insights and incomparable martial arts of the Fremen, but he also understands their religion and culture in ways that allow him to manipulate them. His power appears mystical, but is actually scientific in a way that gives him complete understanding—and control—over it and (almost) all of the people around him. He leads the native people, who are superior warriors, against a decadent enemy, ushering in a new era of centralized imperial power. Paul is the civilizing mission and the native expert rolled into one. But there’s a problem. The Kwisatz Haderach, too, is a trap. Paul becomes a messiah and an emperor, but this places him all the more in thrall to wider ecological, political, and religious systems. In raising Paul up to near-godly levels of control over an interstellar empire, Herbert was not promoting fantasies of imperial power through going native. Rather, he was deconstructing them. Paul’s precognition and his seizure of power combined proves to be unmanageable because all the possible futures revealed to him are terrifying. Furthermore, he now has the power to choose which of these futures will happen: he is responsible for every potential outcome. He makes himself into a tyrant, despot, and messiah to get revenge and power; but once he achieves these goals his future stretches out before him as a career of endless violence, escalation, atrocity, exploitation of superstition that he knows to be untrue, and tyranny on a galactic scale. With power, it turns out, comes not only responsibility, but also a kind of constraint, as various imperial powers have experienced in the Middle East over the past century. For example, British and American attempts to “know” the Middle East, Priya Satia suggests, ended up confusing and undermining imperial administration. In late-nineteenth and early-twentieth-century European empires, positivist fantasies of native knowledge contrasted with realities of violence, atrocity, and incomprehension. Dune takes this connection a step further by suggesting that even the emperor, who is able to combine native knowledge with complete scientific understanding, cannot escape the violence and blowback that comes with imperial power. In other words, Dune is a classic partly because it subverts narratives of progress, knowledge, and civilization that have been central to both science fiction and modern imperial projects in the Middle East. Frank Herbert, Dune (Philadelphia: Chilton Books, 1965). Timothy O’Reilly, Frank Herbert (New York: Frederick Ungar, 1981), 41-42. Edward Said, Orientalism (New York: Vintage Books, 1979), 229-30. Priya Satia, Spies on Arabia: The Great War and the Cultural Foundations of Britain’s Covert Empire in the Middle East (New York: Oxford University Press, 2008); Alex Owen, “The Sorcerer and his Apprentice: Aleister Crowley and the Magical Exploration of Edwardian Subjectivity,” Journal of British Studies 36, no.1 (January 1997), 99-133. Priya Satia, “The Defense of Inhumanity: Air Control and the British Idea of Arabia,” American Historical Review 111, no.1, (February 2006) 116-51. This is made even more explicit in the sequel: Frank Herbert, Dune Messiah (New York: Putnam, 1969). Satia, Spies in Arabia, 323-6. The main reason “spice” was inportant was it allowed interstellar travel by psychic pilots without aid of computers, cause artificial intelect couldnt he trusted to navigate and would hold commerce in its hands and they tried to wipe out humans. Thats when the spice trade became necessary and the real reason spice was important. This is all in reference to our reliance on oil, that during the time, the market was held in the tight clutches of the OPEC Cartel of middle east. Thats what Dune is “about”. Great comparison! I’m reading through the series right now, on book 4. Now I need to re-watch LOA.